INEC declared Kayode Fayemi winner of the Ekiti governorship election which held on Saturday, July 14, 2018. 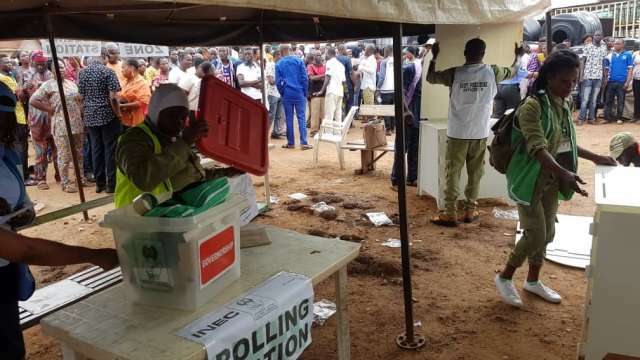 The Peoples Democratic Party in Ekiti state has alleged that the result declared by the Independent National Electoral Commission (INEC) is more than the number of accredited voters in the state. INEC declared » Kayode Fayemi winner of the Ekiti governorship election which held on Saturday, July 14, 2018. The PDP also vowed to deploy all legal means to ensure that their ‘stolen mandate’ is returned. This was made known to newsmen on Monday, July 16, 2018 in Ado-Ekiti by the chairman of the PDP Ekiti state chapter, Barr. Gboyega Oguntuase. According to Oguntuase, the Federal Government used INEC and security agencies to overturn the will of the people. He also allegedly that the government’s aim for to embarrass the Ekiti state Governor, Ayo Fayose. “What did they need 30,000 police officers for in Ekiti when criminals were killing Nigerians in other states? Ekiti people knew they were in our state for a task and not to protect their votes and that was why there was no jubilation or ceremony anywhere in the state after the election. “This election was far from being free, fair and credible. In Ilejemeje, Ilawe, Ikole, Ise/Orun , Oye , Ado and other major towns in Ekiti, many of our people were beaten by APC thugs being aided by the security men. “As we speak, the results declared by INEC to give victory to Fayemi was more than the number of accredited voters. So, where did they get the additional votes they added? “We are going to use every constitutional means to retrieve this stolen mandate, it is just a matter of time. “APC mobilized over N11 billion to buy votes in Ekiti. They came here to perpetrate electoral perfidy and such will not stand,” he added. The Ekiti state PDP chairman also commented on former President Olusegun Obasanjo’s congratulatory message to Governor-elect, Kayode Fayemi. Oguntuase said that the former President’s stand will change when he realizes that Fayemi stole the victory. Former President Obasanjo, » in his message, described Kayode Fayemi’s victory as a huge feat and also urged him to do all he can to restore the hope of Ekiti people in the democratic process.